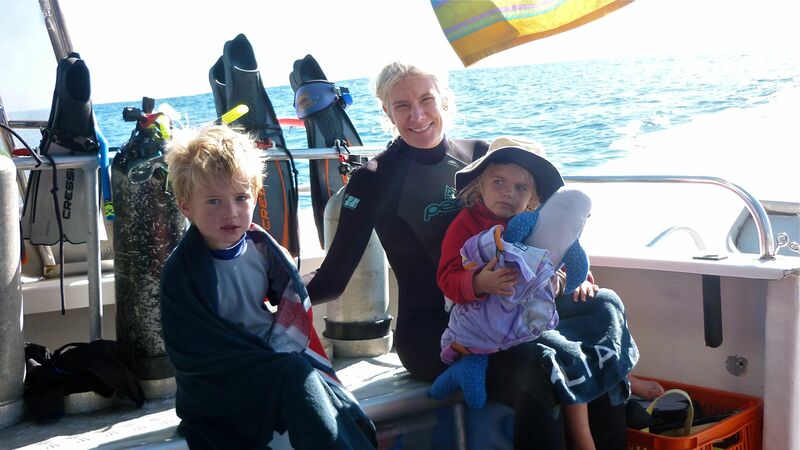 July 2010, Ningaloo Marine Park, Western Australia. The largest fish in the world is swimming at about three miles per hour, but it’s hard, even with fins, to keep up with the 20-foot-long behemoth. A huge happy looking fish with white polka dots sprinkled over its expansive back, the whale shark lumbers leisurely through the cloudy water. Occasionally, it opens its mouth to feed on plankton. A large nonthreatening interior with a noticeable absence of razor sharp rows of teeth is revealed. In fact, it almost looks like white cushions line the inside of the whale shark’s billowing jaws. This is crazy. I can’t believe I’m sauntering along in the Indian Ocean with a whale shark. And we are swimming in some very deep open water — 80 meters (262 feet) — to be exact. In fact, I can’t look down or around. 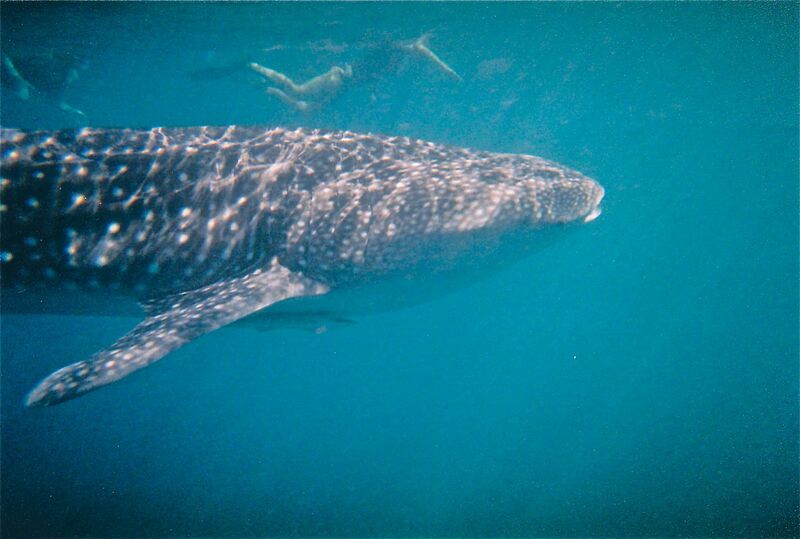 I stare at my new friend, the whale shark, and kick hard. I fall back as the whale shark slowly shifts. Once behind the massive fish, I see them: the same foreboding, angular tail and dorsal fin that have menaced and terrified people on the big screen and the Discovery Channel for years. The tail looks like a large iron boomerang steadily moving back and forth. A friendly tail that crashes up through the surface waving up and down to whale watchers this is not. Indeed, this tail reminds you that this is no whale. It’s a shark. The guide motions for the group I’m swimming with to surface. We do and I’m exhilarated. I can’t wait to get back up on the boat and tell Kurt how cool this is. Before our swimming sessions, we separated into two different swimming groups. That way one of us could stay with our kids Eddie (5) and Kasey (3) on the charter boat. As we swim to the boat, I see Kurt’s group entering the water. “What the?” So, apparently, now we are both in water more than 250 feet deep with our children on the boat that doesn’t have any kid sized life jackets. I’m sure the twenty-something crewmembers, who, from the looks of it at 7:00 a.m. were slightly hung over, are looking after two small children. Yes, surely they are. Group two has already fanned out in the water to swim with the shark, and I hoist myself up on the landing platform and scramble up to find my kids. They aren’t on the deck. Out of breath, I appear in the doorway of the crew cabin. Eddie and Kasey are both laughing at Manny, one of the crew members, who has been coloring with them and making funny faces. Kasey clutches a whale shark stuffed toy. “Ah, no! They’re my new mates. Give me five, Eddie.” Eddie slaps Manny’s hand. Excellent. I was just hoping that someone would notice if one of them fell overboard. I hadn’t expected any of the crew members to actually play with the kids. I sit down to check out their drawings until it is time for my group to go back out. “Go see the whale shark, Steph.” Manny shoos me out of the cabin. “Are you sure this isn’t a problem?” I ask with a mix of I should watch my own children and Dang, I want to go back out and see the whale shark. “No worries, have fun,” Manny says. I love the Aussies. We enter the sea again. Because whale sharks are protected under Australia’s Wildlife Conservation Act and the Conservation and Lang Management Act, measures are strictly followed to ensure their safety as well as swimmers’. No more than 10 participants swim in single file parallel lines at least 3 meters (9.8 feet) away from the shark. Also, the swimming stints are limited to 10 minutes at a time, but swimmers can take multiple turns. 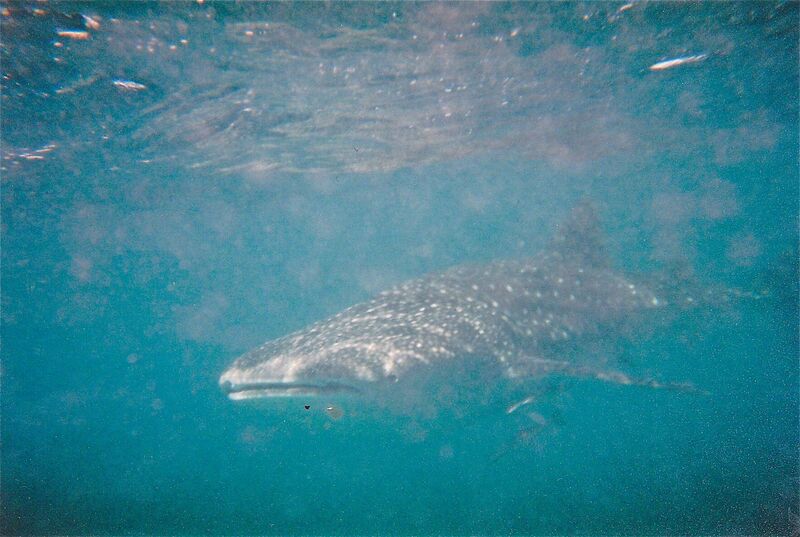 I feel quite at ease, swimming in the water with the polka-dotted giant (whale sharks can grow up to 40 feet in length). The constant fear that four rows of deadly teeth will chomp into you is missing. However, it’s the other creatures in the water that keep a low level of anxiety flowing. One of the other participants swam into a small jellyfish during the previous swim. Last I saw, she had a bag of ice on her face and was lying down. Again it’s time to surface, and since I was the first in line on the shark’s right side, I swim over to Kim, our guide, who the first in line on the left side. “Did you see it? !” Kim asks, removing her snorkel and lifting her mask up. Wow. I guess it’s refreshing that she expresses such enthusiasm every time she swims with a whale shark. Surely, she’s done this dozens of times. “Yes,” I answer although I don’t think I sound half as excited as she does. “Did you see the hammerhead?” She asks again — this time my emotions stir in a different way. “A hammerhead SHARK?” I ask although I know there is no other classification for a hammerhead in the ocean. “Yes, it was circling underneath us a minute ago. It’s my first hammerhead!” Kim practically did an aquatic cartwheel. Holy sh-t! Does she get a hammerhead sighting badge now? “Get me out of here!” is the only thing I’m thinking. Didn’t she just say it was “underneath us a minute ago”…meaning it’s still in the vicinity!?? Kim looks over at me while we are still treading water — now, I know, in shark infested water. “Hammerheads won’t attack. Don’t worry,” she says. Okay, I think, “Unless you’re Jacques Cousteau, lady, I don’t want to hear your theory on shark behavior,” and I don’t want to wait around in this water anymore. I start swimming back to the boat, trying not to think about what lurks behind me. 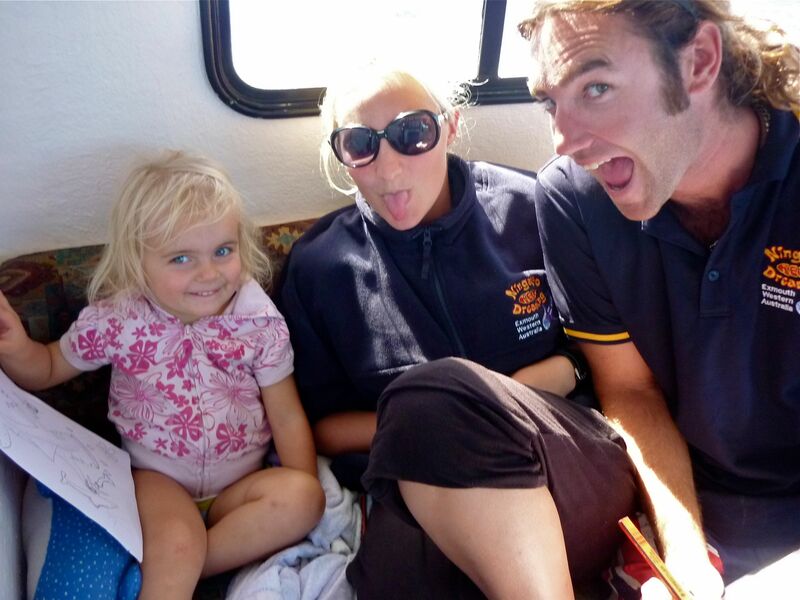 Up on the boat and back with Eddie and Kasey, I am relieved that that was my last swimming stint. Time to remain on the boat and watch the seasick passenger across from me and the woman holding ice to her stung face. Soon Kurt gets back on the boat and I tell him about the hammerhead. “We are in open water,” he reminds me. Soon the whale shark dives like a guided torpedo into the depths of the ocean. Our time with him/her (and the hammerhead) is done. 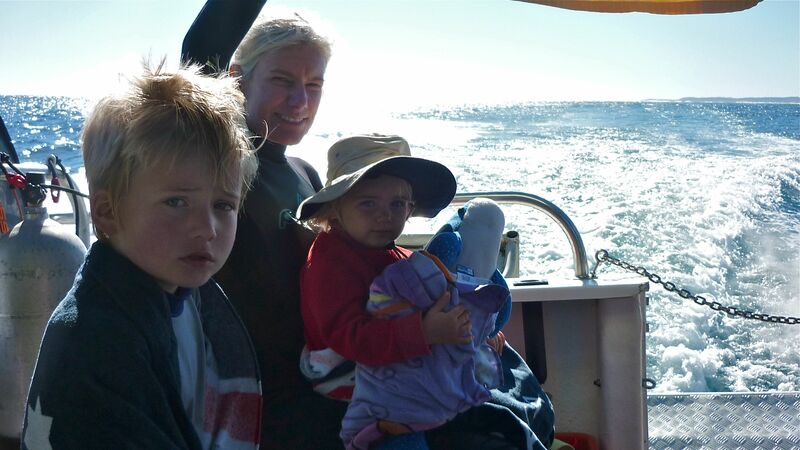 For the rest of the trip, we see humpback whales, dolphins and dugongs (manatees). Everything the psychedelic brochure for the charter company Ningaloo Reef Dreaming promised, we saw. At one point, I look out and see what looks like a discarded hose. “What is a hose doing all the way out here, and who would throw that in the water?” I mention this out loud, and the captain informs me that I was looking at a sea snake, which is incredibly poisonous, by the way. 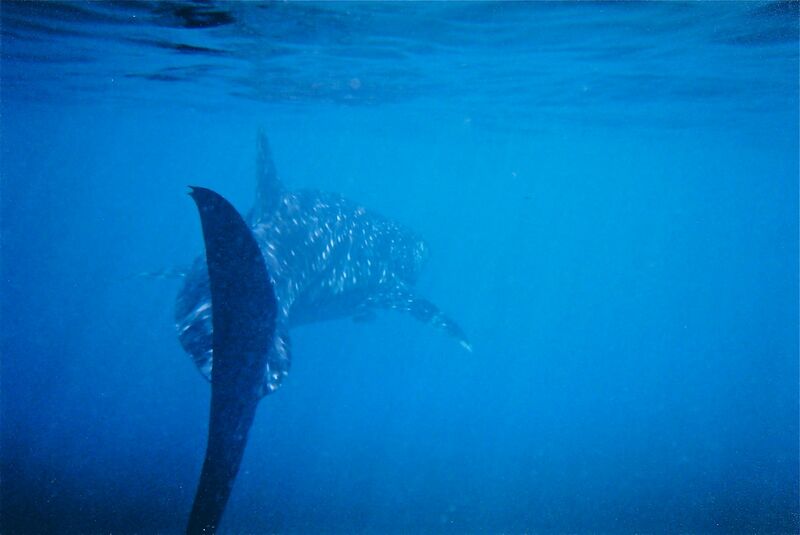 With all the marine life, and of course swimming with the whale sharks, the excursion could not have been more amazing. It was meant to be. 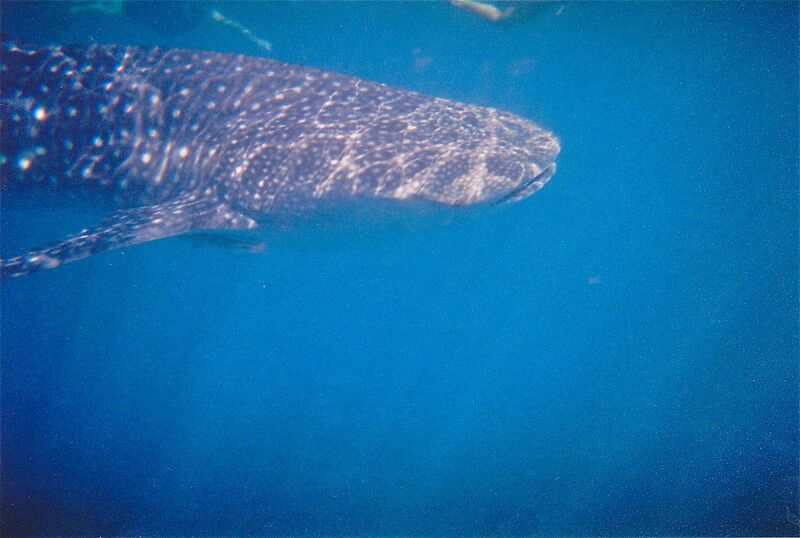 We just so happened to be visiting during the prime time at one of the few places where whale sharks regularly appear on their feeding migration path each year. 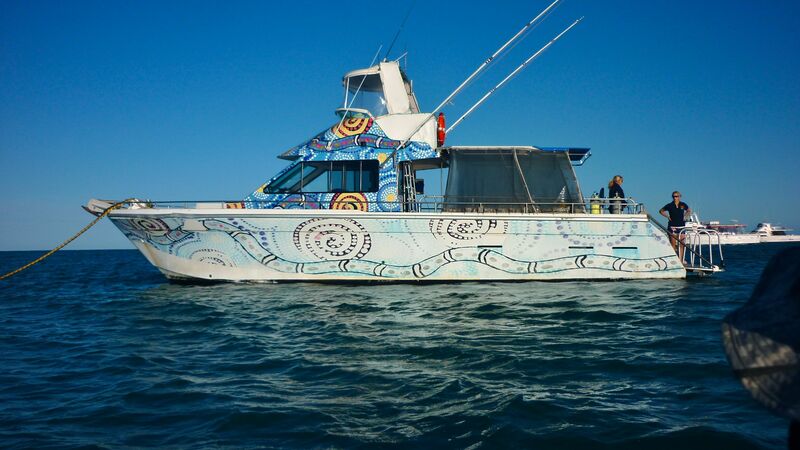 We also were lucky to find Ningaloo Reef Dreaming www.ningaloodreaming.com, which I can’t recommend enough. I actually chose this company primarily because their catchy psychedelic brochure with whales, rays, dolphins in electric colors caught my attention at the Exmouth Vistor’s Centre. 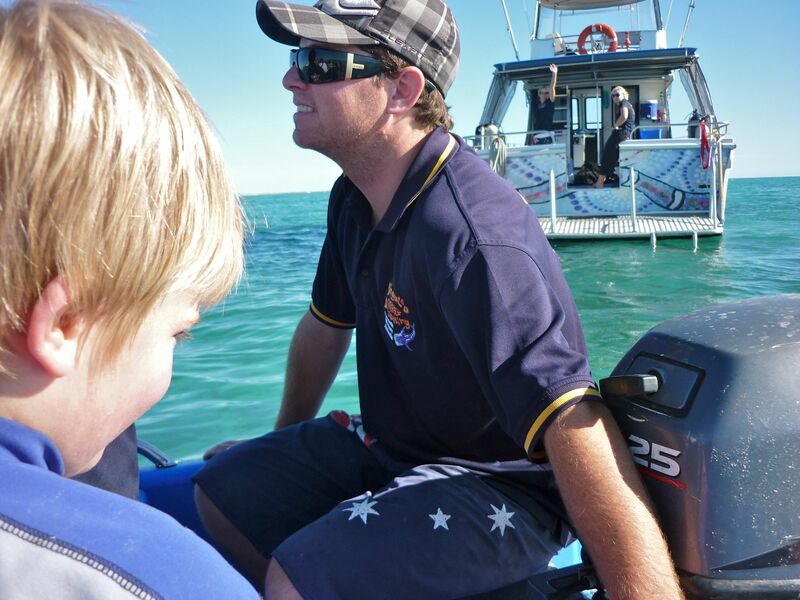 The very friendly staff members (who were not hung over) allowed Eddie and Kasey to ride on the boat for free. The company even allowed them to borrow masks to look under water (in the much shallower part of the reef.) This trip was easily one of the most incredible moments of our year in Australia. And, I also can say this now that I’m in Colorado, thousands of miles from the ocean, I wish I had looked down at the hammerhead. 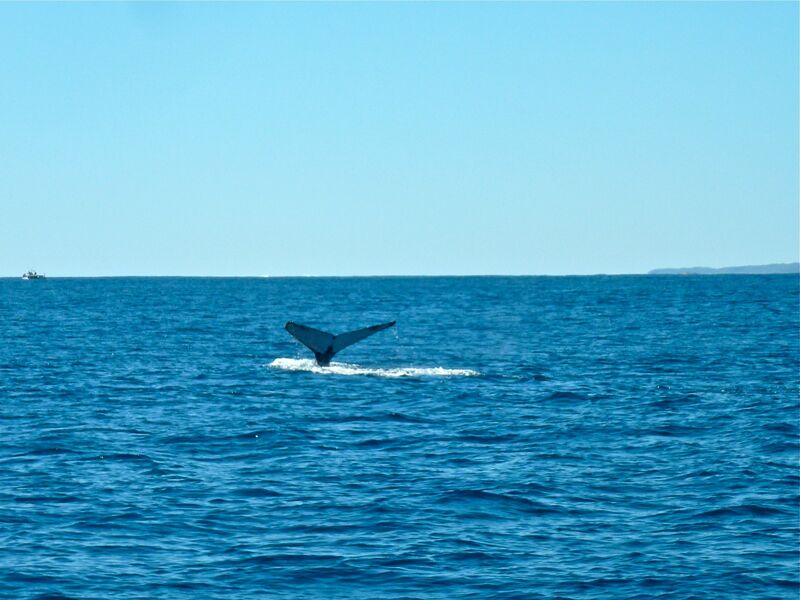 This entry was posted in Adventure, Australia, Nature, Travel, Uncategorized, Wildlife and tagged Ningaloo Marine Park, swimming with whale sharks, Travel Mishap, Travel oops, whale shark by stephglaser. Bookmark the permalink. Thank you, Elke! My husband Kurt took them, and I have to admit I messed with the color a bit on some of the shots with I-Photo. It was actually quite cloudy in the water.